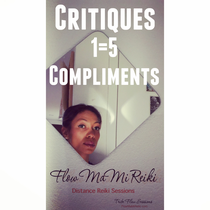 For every Critique that passes your Lips or Mind - give 5 Compliments. We judge. Others. Ourselves. Maybe feelings of jealousy or inadequacy, while we compare ourselves to others. Maybe feeling that we’re not enough, or deserving enough of being fully accepted for how we truly are. I judge. My mind constantly runs around judging - especially myself. It took a long time to accept my curly hair, my round bottom, my full lips, etc. I hid my body for so many years. Now? I’m older 🤗 I wear color on my full lips, I wear fitting pants for my round bottom, and I present my hair more often in her natural cloud of curls. We tend to judge ourselves the harshest, while our friends try to hold the mirror up to us - to notice the beauty that they notice...every time! Tell that lady that you think her hair color is cool - watch her light up. Tell that guy that you think his shoes are pretty awesome - watch him light up.